Atmospheric moisture content is a useful value to monitor for a variety of HVAC control applications, including basic humidity monitoring and control and automation of free cooling processes. This note defines fundamental expressions of atmospheric moisture content and gives calculations that can be used in H I Solutions PC Central software. Moisture content is often calculated given two commonly measured values—air temperature and relative humidity—and can be expressed in several ways. Humidity is the general term for the concentration of atmospheric water vapor. Vapor pressure is the pressure contribution of water vapor to the total atmospheric pressure, reported in millibars [mb] or pascals [Pa] (1 mb = 100 Pa = 100 N/m2). According to Dalton’s Law, the total pressure of a mixture of gases is equal to the sum of the partial pressures of each gas. At a gas’s saturation vapor pressure, the rate of evaporation of molecules equals the rate of condensation. For a given temperature, a gas’s vapor pressure cannot exceed its saturation vapor pressure. At a higher temperature, the rate of evaporation increases, increasing the air’s humidity until a higher equilibrium saturation vapor pressure is reached. In this way, the saturation vapor pressure depends on the rate of evaporation, which in turn depends on temperature. Mixing ratio is the mass of water vapor per mass of dry air [g water/kg dry air]. Specific humidity is the mass of water vapor per mass of the air containing (and including) the water vapor [g water/ kg moist air]. Absolute humidity is the mass of water vapor per volume of dry air [g/m3]. Absolute humidity is less useful because it’s value can change with a change in air volume, without a corresponding change in vapor content. 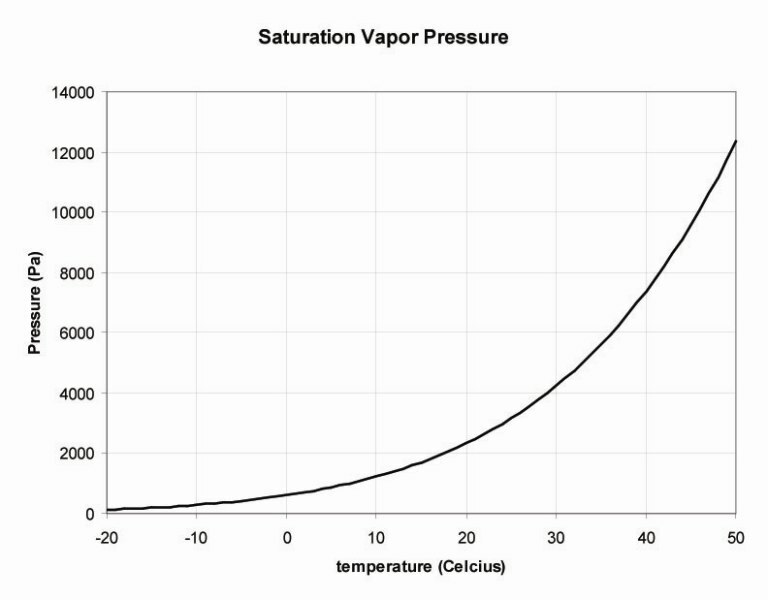 Where e = actual water vapor pressure and es = saturation vapor pressure. Because es is dependent on air temperature, it is possible to change the relative humidity of a body of air without changing its moisture content. Dew point temperature is another way of reporting the water vapor content of air, and is based on the one-to-one relationship between temperature and saturation vapor pressure. At the dew point temperature, the vapor pressure is equal to the saturation vapor pressure. If air is cooled to its dew point temperature, the air becomes saturated with water vapor; further cooling will result in condensation or deposition. Both of the following monitors are based on Lawrence’s equation 8. Simpler approximations for roughly calculating dew point temperature are given in Lawrence (2005). Some approximations are more accurate for certain ranges of temperature and relative humidity. Lawrence, Mark G. (2005) The relationship between relative humidity and the dewpoint temperature in moist air: a simple conversion and applications. Bulletin of the American Meteorological Society, 86 (2): 225-233.